At first glance perfectionism seems like a good thing. We all want to do things well but in reality perfectionism is killing the progress in many network marketers business. I have heard all kinds of reasons why people can’t build their business yet. It is the number one reason people give me as to why they don’t want to start writing a blog. They don’t feel like they know enough so they will wait until they know more. Funny thing that happens when you wait until you know enough. You never seem to get to that point. There will ALWAYS be more to learn. Our fears can keep us stuck in a state of analysis paralysis. There is no perfect person on the planet! We are all human and we WILL make mistakes. 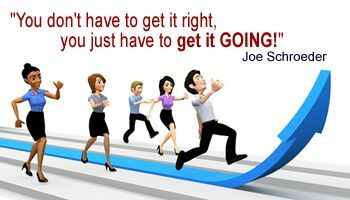 I love that quote by Joe Schroeder, “You don’t have to get it right, you just have to get it GOING!” The way to get anywhere is to start from where you are right now and learn as you go. Learn things –> Share what you learned! –> Repeat –> Learn things –> Share! If you are writing a newsletter or a blog, you can share things you are learning. Share things that will benefit other people. There are many people in need of the things you have learned. Even if you are a brand spanking new distributor, you can start writing a blog. Writing a blog and building a list is one really powerful way to build your business. It’s absolutely HUGE in importance, especially if you have any plan to do any online marketing. I know how easily you can get caught up in details and perfectionism. It’s something I have struggled with over the years in my business. When you find yourself stalled because of trying to get things just right, remind yourself of Joe’s words. You also may want to try the EFT Tapping Session below to help clear feelings of needing things to be perfect. I love EFT for this kind of thing. It really helps me get back on track. Believe me, I use EFT all the time to deal with stresses of business and life in general. It’s a tool I am grateful someone shared with me and I hope you benefit as much as I have. YL Members: I am using Acceptance Oil Blend. See the printable scripts for other options. This is so true in life in general so many people stay in the planning stage that they never get on the road to income or life changing activities. It’s ok to prepare but with a time limit. Hi Steve. Yes and the real fun is when you learn and grow through a forward moving process. Great to see your latest installment! I have known about EFT for several years now and have found it to be an amazing way to relieve the body, psyche, and spirit of unwanted BAGGAGE! Yup! Joe has a lot of good ones. A lot of this boils down to the fact that too many of us simply don’t take the time to enjoy the journey. We’re too fixed on getting to our goal. Developing the skill, working on getting TO the level of perfection we desire is all part of the journey, and traveling alone gets a little boring after awhile. We’re also afraid to let others out there see our faults and weak spots, and we feel like if we can only just get things perfect first, arrive at our own personal success first, then others might pay attention to us. WRONG! I think people actually enjoy taking the journey with us, seeing that we are simply human beings just like they are. And the best part is we end up learning from each other along the way. I agree Steve, a lot of it is fear of letting our faults and weak spots show. It’s good to let people know the leader makes mistakes too. That can help relieve some of the pressure for them when they start out. I really liked this post. You are right on when you said “Our fears can keep us stuck in a state of analysis paralysis.” Trying to be perfect does not help you to move forward in life. We all make mistakes but its what you learn from these mistakes and what you do after making them that will make the difference between not accomplishing any of your goals or being able to move forward and be successful. Thanks for sharing the video on EFT it really does work and I have started doing it for about six months. I was happy to see where that “just get it going” quote came from. I’ve heard it many times, and have used it myself. So now I know it’s origin. Better yet, is to live by it. I’ve certainly screwed up my share of opportunities and challenges by insisting on “perfection”. I think it’s just a well contrived procrastination technique, and adhering to the “get it going” quote, along with EFT, should really help get beyond that barrier (ie., excuse), Melodie. Great advice Melodie … I admit I have to be on guard against perfectionism – kind of a double whammy because as an artist and a writer, what I do not only has to read well, but look good! I don’t agree that perfectionism is necessarily about fear or not enjoying the journey. Speaking only for myself, I’m enjoying the heck out of my journey, I simply want very much to do my best and since a lot of what I do is out there in front of a whole LOT of people pretty much on a daily basis, I think I’d be far more concerned if I weren’t focused on the quality. Great article, I absolutely love that quote from Joe Schroeder you have in that picture! I love that one too Jeremy. Joe has a lot of good ones but that’s my favorite. I have to admit that this idea of perfectionism kept me from starting for a really long time. I just had to know that one more thing and then that one more thing and then . . .
What I found was that if I just sat down and did it, wrote on my blog or created a video or set out to reach out to a few people that once I did those things, I had something to edit if needed. And editing something is so much easier than starting a new one from scratch. I’m reading “Stop saying you’re fine” by Mel Robbins and in her book she points out how our brains love postponing and over evaluating every decision we are about to make. You got me on two counts. I am a perfectionist who gets caught up in the details… and I love EFT! It’s a great tool for getting out of a rut and removing the obstacles. Thanks for a practical and useful post! In graduate school a professor told me that one of the most important things he had learned was that the old saying, “Anything worth doing is worth doing well,” is false! I used to be even more of a perfectionist than I am now. There was a time when I deliberately chose to “do my sloppy deed for the day,” in order to become more comfortable getting it “going” as Joe said. I know that the main reason I have not posted nearly enough on my blogs is that I want them to be more nearly perfect than they really need to be. Re: network marketing, the most important thing a newbie can learn is to just be an “inviter” and not worry about giving the presentation or knowing all the answers. The presentation and the answers are given on the websites and by the upline. The example I have used to teach the inviter principle is the fact that when I attended the first meeting of a new company to find out what it was all about, I invited an acquaintance to attend the meeting with me. I knew nothing! The company gave the presentation and we both signed up. He turned out to be one of my three strongest distributors. Perfectionism is something that is not really part of me. I mostly shoot of the hip. It’s just my personality. But when I’m coaching someone and find they get into the “Perfectionist” hump what I notice is that they are at a stand still. As Nike says “Just Do It” Which is a great phrase if one gets caught up in perfectionism. I must say I greatly appreciate the video of EFT. Several years ago, my hypnotherapist introduced me to this concept. I do it till this day. It really works! I’m sure that introducing this to people unfamiliar to EFT will get them thinking about it. Rinse and repeat. Learn and share it really is that simple. Even though we learned something new not everyone knows it, so we should share what we learn. EFT fascinates me. I want to learn more about it. I have a couple resources, I just need to make myself study it. Have a great day and thanks for the informative article. what a nice article on perfectionism. How would I do this if I knew that I’m succeeding anyway and that I’m doing my best now and this is more than enough! This makes me breathe, realign to what I do and immediaely let o of stress is stress is attached to my obsession of having the work done perfectly. I agree with Marty when she says she focuses on quality I do too. There is a fine line for us to be aware of bewtween doing our best and feeling imprisoned by our belief that we are not enough. 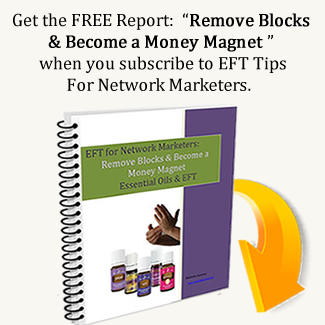 Thanks for his wonderful post, I use EFT too and it helps me andmy clients on the spot. Congrats on your video too! I think this is one of the most difficult challenges that many people face online. The perceived need to make it perfect before it goes out the door. So many folks have been stopped on the path to greatness because they have the wrong color shoelaces in the their walking shoes. Wonderful insight on this topic Melodie! Perfectionism is a form of procrastination. I have written about this over the years. It is our fear that holds us back and we think just one more webinar will make us ready to make that move. I have to say I was glad to step out of my comfort zone and get help through coaching. My first mentor pointed out the fact I was thinking nothing could go forward without having enough experience or knowledge behind me. But as I learned and continue to know is true, we are always learning and growing. So thank you Melodie for sharing your inspiration of ‘Just get going’! Perfectionism will kill any endeavor. Nothing is perfect, especially human beings. Perfectionism is just another word for procrastination and fear of making a mistake. Forget about it. You’re human? You’re going to make mistakes. Get on with it, already! I’ll step off my soap box now. Thanks. Melodie, you just wrote the blog post that I absolutely have to share with a good friend. She is so focused on being perfect and with having everything line up neatly in life that she doesn’t just get down to work. She hasn’t gotten to where she wants to be in an entire year…and it’s starting to wear on me, as much as I love her. The truly interesting thing is that she always talks about her childhood and her father, as though that matters in why she won’t write an article quickly or syndicate the way that she needs to do. I am not sure if it’s meaningful, but I separate my family from my work; the two are unrelated in my mind. She doesn’t do that, and I just don’t understand why. I really need to share your site with her so she can start to move forward. I tell a lot of business owners who hmm and ha around about starting certain things. They want it to be perfect. The problem is…business is not always a perfect dealing. It takes failure and learning to build the knowledge toward success. The simple nugget: Just get going. Paralysis by analysis tends to get a lot of people these days. They see the sites of all the “guru’s” in our industry and somehow manage this theory that their site needs to be just like that if they are going to receive the same results. Or worse yet they keep fiddling with the settings and use that as an excuse not to write any content. Blogging for leads is hard enough and takes a long time, so the longer you mess around with the look of your site the longer its going to take for it to work for you. A mentor once said “Imperfect progress is better than perfect inaction.” It think we should establish a firm target of when we are going to launch our new ides. Perfect it all we want, but when we hit that date release, commit to putting our offer out to the world. Getting real-world feedback from our market is an important input in designing effective services that our clients are hungry for. I agree that perfectionism can kill the progress in business. We need to take action and learn from our mistakes. We need a lot of patience and persistence. Hi Melodie, I think the “old school” way of doing Network marketing made it more difficult for some people to get started too. However, with starting up a blog, if people are writing about something they’re passionate about, they shouldn’t have so many fears. My hubby is a perfectionist, although he “gets it done” eventually, just takes a bit longer. Me, I’m a bit too much the other way, I’ll do some things that aren’t really that good and be happy with it, until I change it later. Thanks for the reminder about “getting things done” instead of trying to be perfect! As we are sharing what we have learned we are internalizing it and we are learning through sharing. Yes, we are all teachers and students, sometimes at the same time. Great post! I agree that we sometimes tend to plan things out very carefully or prepare too much for something then we just aren’t able to go ahead and just do it. We want everything to be perfect but we realize that we all make mistakes and that we should just start and learn along the way. Love what you said – “Learn things –> Share what you learned! –> Repeat –> Learn things –> Share!” I totally agree with this and follow it always. Yes that perfectionism thing!! I think I have that !! LOL I do use EFT and find it very useful. Great post, Melodie!! If you continue to plan and research and learn, then you will never get anywhere. you only be a person who is broke but has a lot of knowledge. I love your EFT video, and this post! I have spent so many years working with not only my people but myself getting over that darned perfectionism. I love that some brief tapping can get us past it. Getting ready to get ready will kill our business every time!